^ Honour and Fleming (1982), p. 447. ^ In 1855, William Stirling wrote in Velázquez and his works: "Velázquez seems to have anticipated the discovery of Daguerre and, taking a real room and real people grouped together by chance, to have fixed them, as it were, by magic, for all time, on canvas". López-Rey (1999), Vol. I, p. 211. ^ Millner Kahr, Madlyn. "Velazquez and Las Meninas". The Art Bulletin, Vol. 57, No. 2, June 1975, p. 225. Held, Jutta and Alex Potts. "How Do the Political Effects of Pictures Come about? The Case of Picasso's 'Guernica'". Oxford Art Journal 11.1 (1988): 33–39. Kahr, Madlyn Millner. "Velazquez and Las Meninas". The Art Bulletin 57(2) (June 1975): 225. Russell, John. "Masterpieces caught between two wars". New York Times, 3 September 1989. Retrieved 15 December 2007. Snyder, Joel and Ted Cohen. "Reflexions on Las Meninas: paradox lost". Critical Inquiry 6 (Spring 1980). 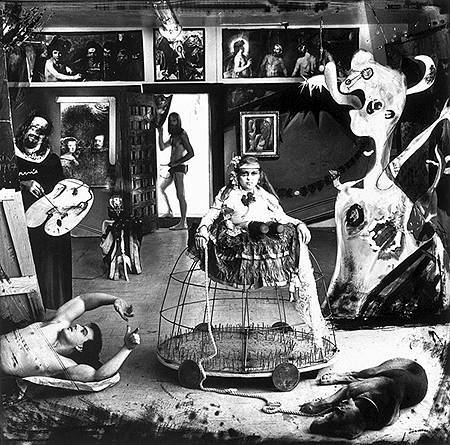 Joel-Peter Witkin "Las Meninas (Self Portrait)"
This page is based on the Wikipedia article 宮女 (委拉斯開茲); it is used under the Creative Commons Attribution-ShareAlike 3.0 Unported License (CC-BY-SA). You may redistribute it, verbatim or modified, providing that you comply with the terms of the CC-BY-SA.